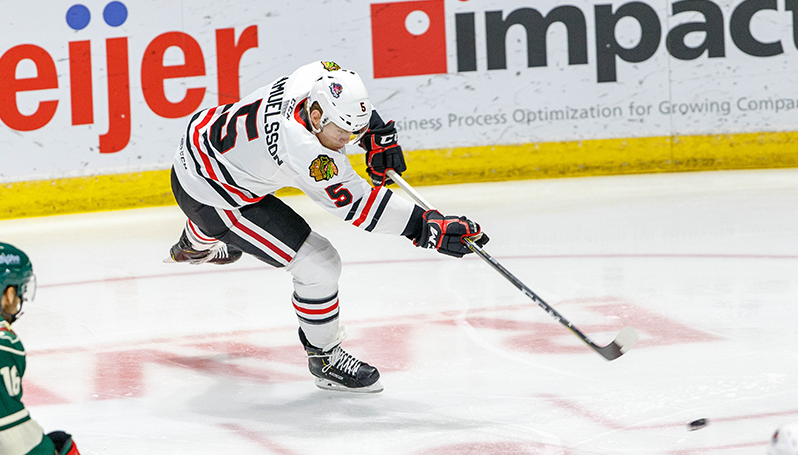 ROCKFORD, Ill – The American Hockey League’s Rockford IceHogs today announced they have loaned forward Henrik Samuelsson to the ECHL’s Idaho Steelheads. Idaho currently owns Samuelsson’s ECHL contract rights. Samuelsson, 25, has spent the 2018-19 campaign with the IceHogs and logged two goals and five assists in 40 games. He notched points in three of his first seven games this season, including finding the scoresheet in back-to-back games on Oct. 13-14, and most recently tallied an assist on Jan. 6 vs. Iowa. Overall, the Pittsburgh native has tallied 19 points (11g, 8a) in 65 AHL games with the IceHogs over the last two seasons. Since making his AHL debut with Portland in 2014-15, Samuelsson has combined for 74 points (34g, 40a) in 201 AHL games in six seasons. The forward returns to Idaho, where he spent the majority of the 2017-18 season prior to signing a PTO with the IceHogs. Samuelsson has notched 43 points (16g, 27a) in 49 contests with the Steelheads. Samuelsson was originally selected by Arizona in the first round (27th overall) of the 2012 NHL Draft.